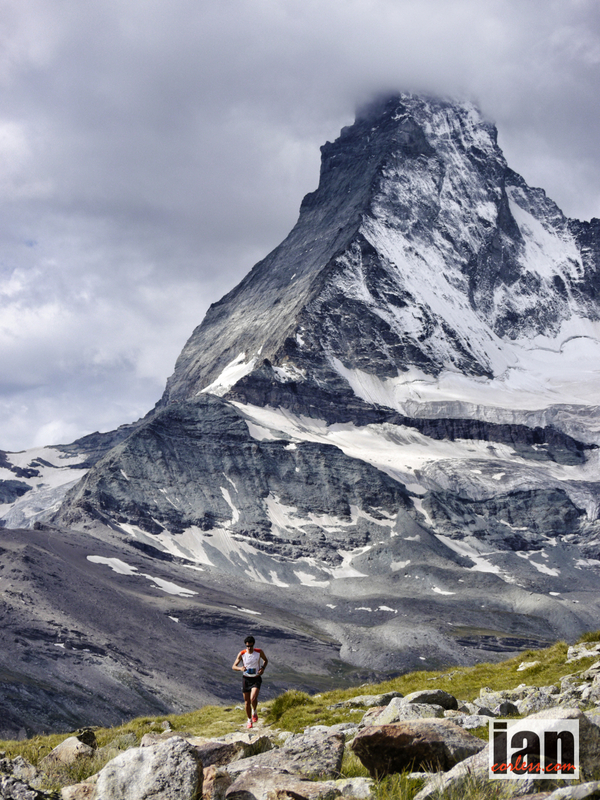 The inaugural Skyrunner World Series, Matterhorn Ultraks, saw a stellar field line up in the centre of Zermatt, Switzerland at 0700, Saturday 24th August to do battle over 46 km in the fourth race of the ‘Sky’ series. Salomon duo, Kilian Jornet and Emelie Forsberg topped the podium in what is proving to be a stunning and dominant year for the pair of them. Kilian Jornet, racing after his incredible ‘Matterhorn Summit’ set only couple of days previously expressed how beautiful the course was. On questioning, he said, ‘I felt a little tired today after the efforts of Wednesday, but this course was really beautiful and it was nice to be on the other side of the Matterhorn’. 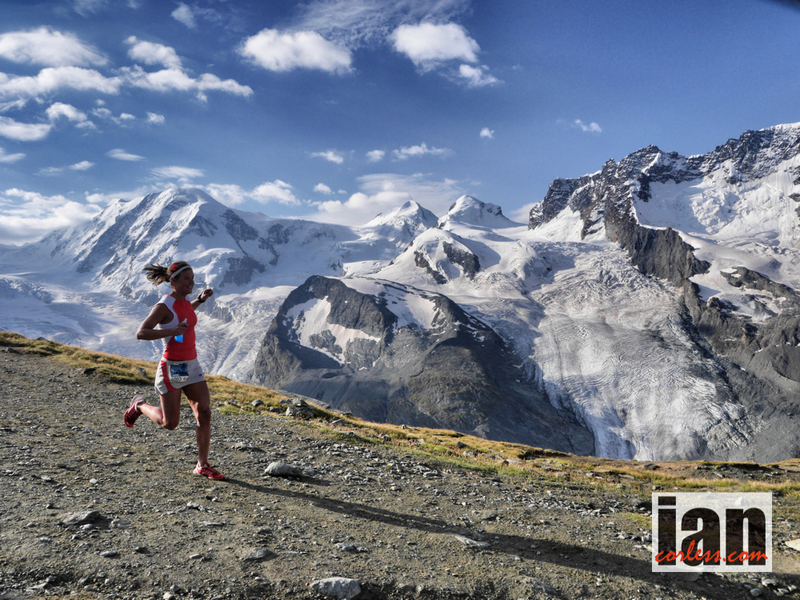 Emelie Forsberg had a similar response, ‘Wow, it’s such a beautiful course with glacier at Gornergrat and then of course the Matterhorn ever present while we run. However, my legs felt heavy today… I don’t understand it! To be honest, I don’t like it…’ laughing she continued, ‘I’m really happy to win, it has been a great first edition’. Departing Zermatt at 0700 with the arrival of day light, runners departed and headed upwards to the highest point of the course at nearly 3000m to the ‘Scott Summit’ at Gornergrat. First runner to arrive was Egea Caceres Aritz in 1:40:36 (winning the Scott summit prize) closely followed by Luis Alberto Hernando (adidas) and Kilian Jornet (Salomon).Not only was the race moving much faster than pre race predictions but also some of the main anticipated protagonists were having a tough day. Philipp Reiter (Salomon) and Tofol Castanyer (Salomon) had stomach issues and had to restrain their efforts, Philipp would go on to finish 19th but Tofol was forced to withdraw. Cameron Clayton Salomon) from the US who had placed top 5 at Pikes Peak just the previous weekend was also struggling with some chest issues. Emelie Forsberg (Salomon) was the first lady to arrive at the ‘Scott Summit’ followed by team mates, Oihana Kortazar (Salomon) and Silvia Serafini (Salomon). Emelie continued to push at the front of the race and at Schwarzee she looked comfortable and relaxed. However, behind Silvia Serafini was caharging and not only had she closed the gap on Emelie but she had moved into second place. 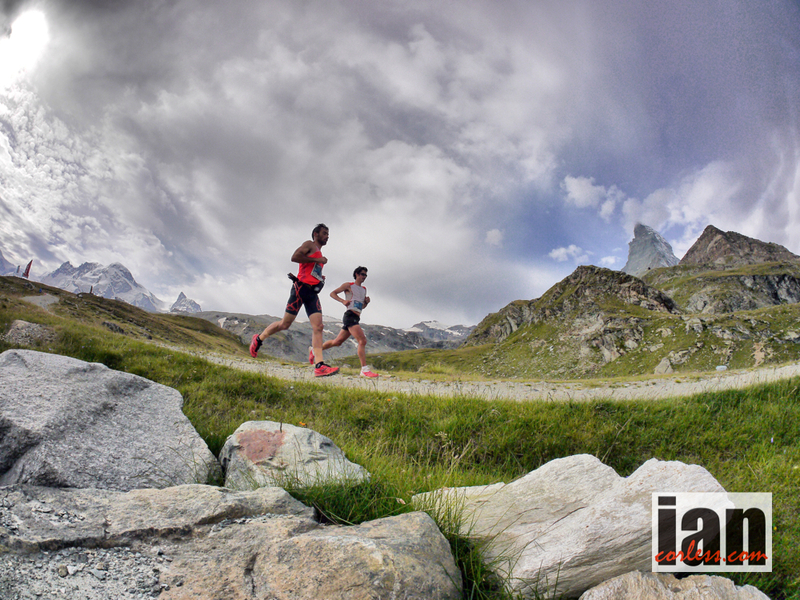 The front of the race took shape, Kilian Jornet and Luis Alberto Hernando run together, step-by-step just as they have so many times before this year. 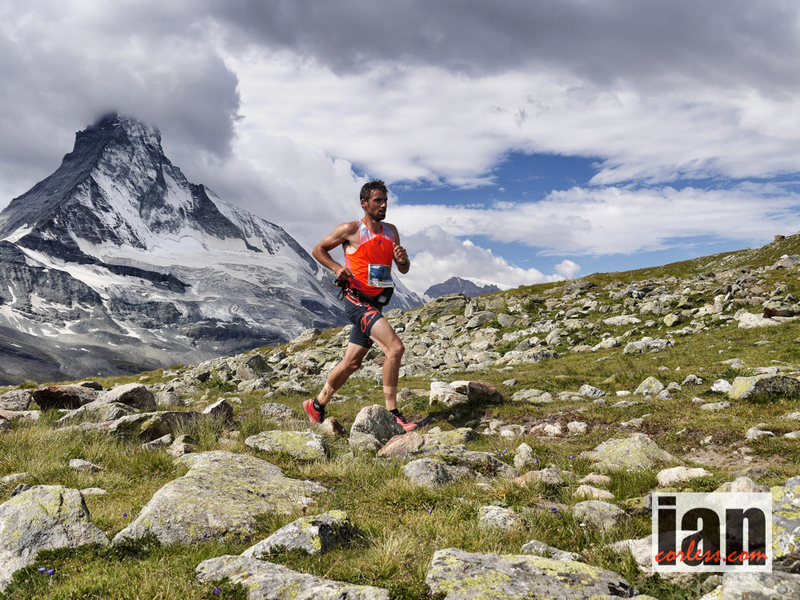 However, just before Trift on the plateau with Matterhorn providing a stunning backdrop, Kilian opened up a gap that he would maintain all the way to the finish for another victory. Behind Kilian and Luis a really great battle was unfolding, Sierre-Zinal Marc Lauerstein had been caught by Nicola Golinelli (Arc’teryx) and with another great surge, Nicola followed up his impressive performance at Mont Blanc Marathon with 3rd place on the podium here in Zermatt. Swiss runners, Marc Lauenstein, Sierre-Zinal winner, and Ultraks ambassador Martin Anthamatten were fourth and fifth respectively. The women’s field was comfortably led by Emelie Forsberg, Silvia Serafini once again showed that with each race she is becoming more experienced, more confident and more dominant. 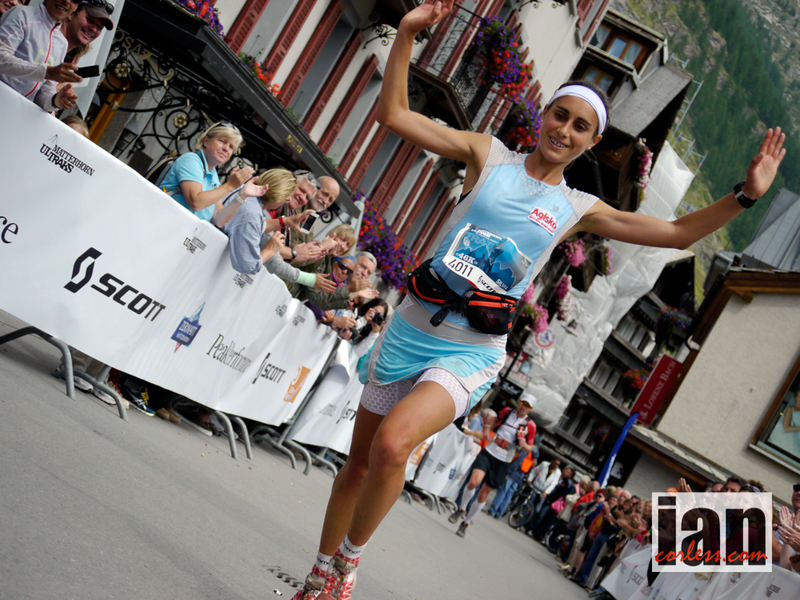 Her impressive showing at the Dolomites Skyrace was followed up here with another great 2nd place. Oihana began to weaken and loose time leaving third place open for Nuria Dominquez (Buff) to take third, Anna Lupton (inov-8) from the UK had a great run for fourth and Ragna Debats (FEEC) placed fifth. Anna said on the finish line, ‘that is the most incredibly beautiful race I have ever done but it was also the hardest’. Four teams from Spain competed in the event, counting no less than five men and five women in the top ten. A result that confirms Spain’s dominance in the sport. The Sky Series final, hosted by the Limone Extreme, will take place in Italy on the slopes above Lake Garda on October 13, where the world’s top skyrunners will compete and the champions will be crowned. This entry was posted in Uncategorized and tagged Arcteryx, Buff, Emelie Forsberg, Inov 8, Inov8, ISF, Kilian Jornet, Luis Alberto Hernando, Matterhorn, Mountain, nuri dominguez, photography, Race, Race Summary, Running, Salomon, Silvia Serafini, Sky, Skyrunning, Switzerland, trail, Ultra, Ultraks, ultratrail, Zermatt by talkultra. Bookmark the permalink.